The majority of us use electricity every day on the job. This kind of familiarity can create a false sense of security. It’s important to remember that electricity is always a potential source of danger. Only use tools that are properly grounded or double-insulated. Make sure the casings of double-insulated tools are not cracked or broken. Always use a ground fault circuit interrupter (GFCI) when using portable electric tools outdoors or in damp or wet locations. GFCIs detect current that may be leaking to the ground from a tool or cord, and they shut off power before injury or damage can happen. Any shock or tingle, no matter how slight, means that the tool or equipment should be checked and repaired. 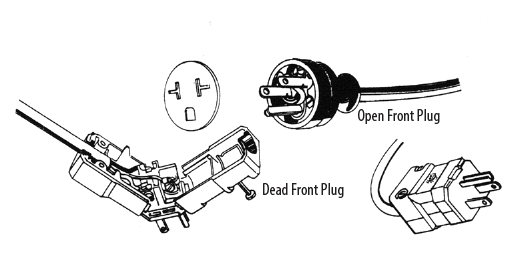 Never bypass broken switches on tools or equipment by plugging and unplugging the cord. Shutting off power will take too long in an emergency. Before drilling, nailing, cutting, or sawing into walls, ceilings, and floors, check for electrical wires or equipment. Make sure that tool cords, extension cords, and plugs are in good condition. Make sure the extension cords are the right gauge for the job to prevent overheating, voltage drops, and tool burnout. Use cords fitted with dead front plugs. These present less risk of shock and short-circuit than open front plugs. Don’t use cords that are defective or that have been improperly repaired. Don’t wire cords into outlets. Disconnecting takes too long in an emergency. Protect cords from traffic – from vehicles or pedestrians. For example, a cart that is pushed over a cord repeatedly can weaken the cord, making it dangerous. Also, pedestrians can trip over cords, leaving them halfway unplugged, which is also hazardous. Temporary panel boards must be securely mounted, protected from weather and water, easily accessible to workers, and kept clear of obstructions. Use only fuses or breakers of the recommended amperage. For example, if the electrical system is rated for 30 amps, don’t use a fuse or breaker that’s higher than 30 amps. Follow established procedures when locking out panels. In New Brunswick, the law regarding electrical safety and lock out can be found in General Regulation 91-191 under the Occupational Health and Safety Act, sections 83-84, 239-240, 270, 284, and 286-287.6.